A few Guwahati traders have been fined for indulging in food adulteration. Kamrup (Metro) district administration has collected Rs 8 lakh worth of fines. ADC Prasanta Pratim Kathkotia, who carried out a number of raids in the Fancy Bazaar area, said at least 82 cases have been registered against traders who were cheating buyers by selling food products of low quality. Kathkotia said similar raids will be carried out in other city markets. “Prakash Kabra, a mustard oil trader in Fancy Bazaar, was fined Rs 1 lakh. Dulal Mandal, a food business operator in Fancy Bazaar as well as the Bimal Oils and Foods Limited have been fined Rs 1.4 lakh each for selling oil of low quality,” said a statement issued from the DC office. Ambaji Food Products Limited of Ranchi has also been fined Rs 1.25 lakh for distributing food items of poor quality. As food adulteration is a crime under the Food Safety and Standards Act, 2006, deputy commissioner Virendra Mittal has asked the officials to intensify their operations, reports TOI. Corrupt fruit vendors are not being spared either with a trader from the area being fined Rs 20,000 for ripening bananas using carbide. 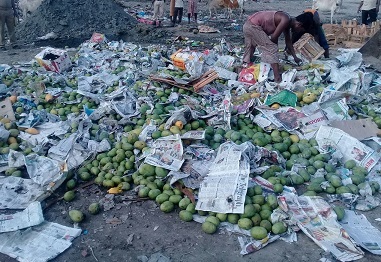 Officials of the district administration and had destroyed around 12.5 quintals of mangoes after these were found to be ripened using chemicals in market in Fancy Bazaar a few weeks ago. The market value of the damaged mangoes is reportedly more than Rs 62,000.